Watercolour is Gwen’s first and foundational medium, starting at her kitchen table while young children napped in her 20’s. Now, 30 some years later, she still loves to work in this medium and exploring its limits. 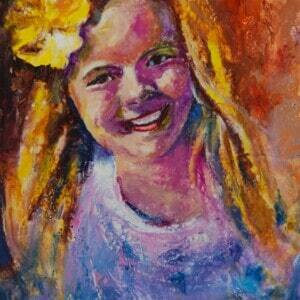 She enjoys the luminosity and the pure excitement of this somewhat unpredictable medium. She has been an avid photographer and is remained committed to working from her own photographs in producing her paintings. Flowing in the moment, “in the water,” enjoying the different papers’ responses, working from her photos or real life, in the studio or on site, never fails to reward her with much joy. Most of her art sales have been of originals or prints of her watercolor pieces. 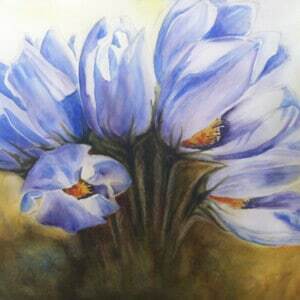 She has also been teaching watercolour to both adults and children since 1996. Drawing on her experience in watercolour, Gwen expanded into mixed media using water-based mediums. During this phase of her artistic career, she enjoyed pushing the limits with papers, while expanding her colors with inks, acrylics, watercolors and pastels. This allowed for more expression and non-representational works to evolve. Discovering encaustic while visiting Montana in 2006, Gwen was captivated by this exciting medium. Dating back to Ancient Egypt, this medium is making a great comeback in the past 15 to 20 years around the world. The luminosity of encaustic captured Gwen’s eye, the texture captured her sense of touch, and of course the smell of the beeswax was so enticing. Large paintings on birch wood panels, not needing frames and working with the beautiful natural medium became her new passion. She expresses her designs in two ways with this medium. One with multiple layers of natural beeswax and oil paints rubbed in by hand and then torched (sealed) then smoothed with a blade to a glass-like finish. The other is a more direct approach with colored wax sticks melted and mixed on a griddle like a paint palate, then torched to seal it on the board. Both are super challenging, working with the medium’s unpredictable nature, and very rewarding. 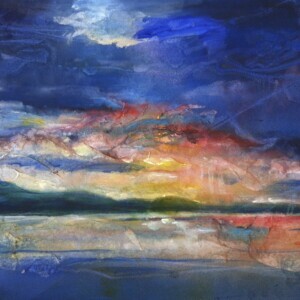 Encaustic has also offered more opportunities for Gwen to expand her joy for non-representational (or abstract) pieces. Gwen’s newest passion is working on-site, mostly out of doors, capturing the moment in the natural lighting. This is best done in oil paints. This way of creating art, fully married her love for the outdoors and her love for painting. 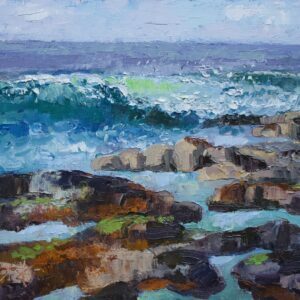 She first began painting in oils with brush or palette knife in 2016. Whether finding her way on cobble stone streets in Mexico, walking through the snow on her own farm in January, or setting up in the heat of the Drumheller Valley, hiking in the Rocky Mountains with her heavy painting pack on her back, she loves to find and express her emotional connection with the scene before her. The challenge of painting from life, dealing with the changing daylight, the weather elements, the vast scene that needs to be minimized into a single scene, all stimulate and push her artist abilities.